Illegal stocking of northern pike is reducing fishing quality in Southcentral Alaska by threatening both wild and stocked fisheries. The northern pike is native to most of Alaska, but it does not naturally occur south and east of the Alaska Mountain Range except for a small, remnant population near Yakutat. Pike are top-level predators in aquatic food chains and are highly piscivorous (fish eating). Outside their native range, trout, salmon and other fish have not had time to adapt defenses against pike’s predatory tactics. Pike prefer vegetated, low flow, shallow habitats where they can hide and ambush prey. Areas like these are plentiful throughout Southcentral, and pike tend to thrive in these locations, often to the detriment of native species. For this reason, in Southcentral, the northern pike is an invasive species. Invasive species are plants or animals that do not naturally occur in an area and can negatively affect the environment, the economy, and/or recreational activities. In Southcentral Alaska, northern pike are doing just that. Pike were first illegally introduced into area waters by people, and are now spreading through open waterways and decimating salmon and trout populations. This causes ecological damage and also negatively affects the economy by reducing recreational fishing opportunities. Where northern pike naturally occur in Alaska, they are highly valued as a subsistence and sport fish. In these waters, there can be many other fish species, such as whitefish, sheefish, suckers, Alaska blackfish, stickleback, and char. In their native range, pike are simply another member of the fish community, living in a balanced ecosystem with other species. Pike prey on rearing salmonids. Never transport and release aquatic organisms into waters of the state. In order to protect our fisheries which bring millions of dollars each year to Alaskans, the State of Alaska has a very cautious fish stocking policy. According to state regulation 5 AAC 41.005, NO LIVE FISH or fish eggs may be transported, possessed, exported, OR RELEASED INTO THE WATERS OF THE STATE without a special permit issued by the Commissioner of ADF&G. This means you cannot put live fish, even “salmon fry or sticklebacks,” in a bucket and take them home because you are possessing and transporting live fish without a permit. 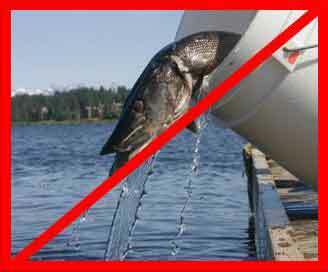 You certainly cannot take fish, including pike, from one waterway and “seed” them into another. It is illegal (Class A misdemeanor with a $10,000 penalty) and can cause major problems. This applies to all aquatic organisms. Northern pike are in Southcentral because of illegal introductions. Northern pike were first introduced to Bulchitna Lake in the Yentna River drainage in the 1950s. Since then, they spread to open systems and dispersed on their own. Through a combination of this dispersal and many more illegal introductions, invasive pike have been found in over 100 water bodies in the Mat-Su Valley, Anchorage, and the Kenai Peninsula.